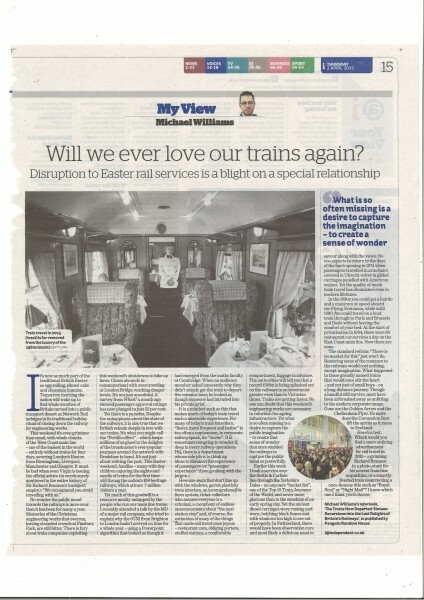 Easter rail shutdown – the end of our affair with the railways? IT’S NOW as much part of the traditional British Easter as egg-rolling, simnel cake and chocolate bunnies. This Good Friday morning the nation will wake up to find whole swathes of Britain turned into a public transport desert as Network Rail indulges in its traditional holday ritual of closing down the railway for engineering works. No wonder the public mood towards the railways is sourer than it has been for many a year. Memories of the Christmas engineering works that overran leaving stranded crowds at Finsbury Park are still bitter. There is fury about train companies exploiting this weekend’s shutdowns to hike up fares. Chaos abounds in commuterland with overcrowding at London Bridge reaching danger levels. It’s not just anecdotal. A survey from Which? a month ago showed passenger approval ratings of the rail companies has now plunged to just 52 per cent. Yet there is a paradox. Despite the unhappiness about the state of the railways, it is also true that we British remain deeply in love with our trains. It’s what you might call the Portillo effect – which keeps millions of us glued to the delights of the broadcaster’s ever-popular journeys around the network with Bradshaw in hand. It’s not just about reliving the past. This Easter weekend families – many with tiny children enjoying the sights and smells of trains for the first time – will throng the nation’s 108 heritage railways, which attract 7m visitors a year. Yet much of this goodwill is a resource mostly untapped by the people who run our main line trains. I recently attended a talk by the MD of a major rail company, who tried to explain why the 07.29 from Brighton to London hadn’t arrived on time for a whole year – using a Powerpoint algorithm that looked as though it had emerged from the Maths Faculty at Cambridge. When an audience member asked innocently why they didn’t simply adjust the timetable to make the train run on time, he looked as though someone had intruded into private grief. Here are seats that don’t line up with the windows, garish plasticky train interiors, an incomprehensible fares system, ticket collectors who assume everyone is a criminal, a cacophony of endless announcements about “the next station stop” and – and of course, the extinction of many of the things that made rail travel once joyous – restaurant cars, obliging porters, staffed stations, waiting rooms with blazing fires, a comfy compartment you could snuggle in, luggage in advance. The authorities will tell you a record £38bn is being splashed on the railways in an investment greater even than in Victorian times. Trains are getting faster. No one can doubt that this weekend’s engineering works are necessary to refurbish the ageing infrastructure. Yet what is so often missing is a desire to capture the public imagination – to create that sense of wonder that once enabled the railways to capture the public mind so powerfully. Earlier this week I took a service over the Settle & Carlisle line through the Yorkshire Dales – in anyone’s “bucket list”, one of the Top Ten Train Journeys of the World, and never more glorious than in the sunshine of an early spring day. Yet the ancient diesel carriages were rusting and worn, belching black fumes and with windows too high to see out of properly. In Switzerland there would have been observation cars and must likely a delicious meal to savour along with the views. No one expects to return to the days of the line’s opening in 1874 when passengers travelled in armchairs covered in Utrecht velvet in gilded carriages panelled with American walnut. Yet the quality of much train travel has diminished even in modern lifetimes. In the 1930s you could get a hairdo and a manicure at speed aboard the Flying Scotsman, while until 1980 you could travel on a boat train through to Paris and Brussels and Basle without leaving the comfort of your bed. At the start of privatisation in 1994, there were 80 restaurant car services a day on the East Coast main line. Now there are none. The standard refrain: “There is no market for this” just won’t do. The best-kept secret on today’s railway can be found in the handful of Pullman dining cars on First Great Western services out of Paddington to the West Country where freshly-cooked meals accompanied by fine wines are still served by uniformed stewards. The waiting list for bookings would be the envy of a West End restaurant. Restoring some of the romance to the railways would cost nothing, except imagination. What happened to those grand named trains that would once stir the heart – and not just of small boys – on a long-distance journey? Though a handful still survive, most have been airbrushed away as unfitting to the modern corporate image. Gone are the Golden Arrow and the Cheltenham Flyer. No more does the Coronation Scot quicken the spirits as it races to Scotland. Here’s a test. Which would you find more enticing advertisement for rail travel in 2015 – a grinning Richard Branson in a photo-stunt for his newest franchise acquisition? Or a smartly liveried train resurrecting a once-famous title such as “Royal Scot” or “Night Mail”. I know which one I think you’d choose.